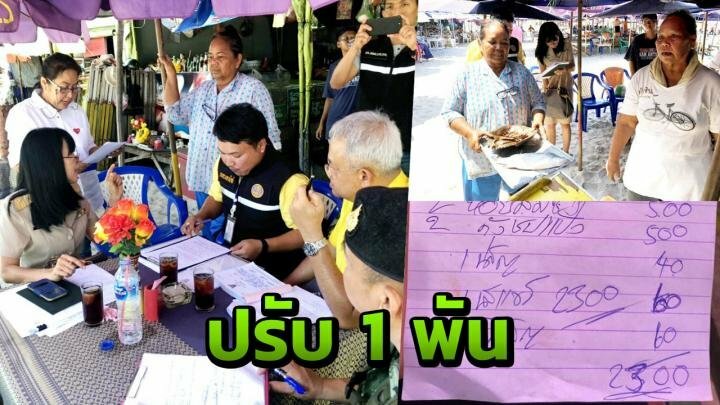 Thai Rath reported that officials in Hua Hin visited a beach seafood seller at the center of rip off allegations on Thai social media. But rather than fining the owner for the expensive seafood in the 2,300 baht bill, she was fined for selling ice at above agreed prices. Distributed for 10 baht a bag Aree Numjaroen's various menus at "Pa Kaew Seafood" listed the ice price as being both 20 baht and 30 baht. 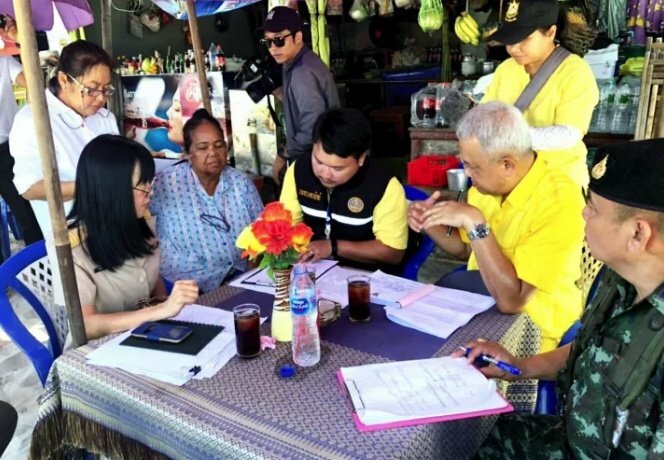 That was enough for Prajuab Khirikhan official Prasopchai Phoonkert to fine her 1,000 baht for contravening an agreement between the vendors and the local municipality. Aree or Aunty Kaew admitted she was banged to rights on that one but argued that it was a first offence. Prasopchai told reporters that it was important to maintain the image of Hua Hin and to protect tourists from unscrupulous traders. But Aunty Kaew has not taken the matter of the online post by a Thai woman lying down. She has reported Nanthamonluk Woratarathorn to the Hua Hin police for damaging her business. She said that her online claims were rubbish and asked her to go with her to the police to clear things up. She questioned why the customer and her family had paid the bill then gone online to have a go at her afterwards. I can guarantee Aunty Kaew did not say, "You got me bang to rights, guv'nor." I would like to know how she phrased it. This all stems from the power of the nose job and white skin of the complainant. It signifies high status in Thai culture so the Hua Hin authorities were forced to be seen to be doing something. Look at Aunty Kaew, black as the ace. She didn't stand a chance. Wasn't it only a few months ago that there was a headline in the lines of "Thais don't cheat on Thais"? Can these rip off artists not see that in the long run it damages business overall? Oh...sorry...of course they can't! When long term planning is "What's for dinner?" all hope for critical thinking is lost. ...to avoid being beaten up by her entire family? they rip of people a hundreds thousand baht a month, especially clueless Thais as they never complain and just pay bc they dont want to be shy in front of their families somehow. never understand this but respect their culture of course. and they get a fine of 1000 baht! man, even bill was 2300 baht! so they will compensate the 1000 baht fine from just one bill and will continue to rip people off. clearly vendors there ripping people off and protected somehow! Although this has made Thai Visa, my guess is that Thai social media is ripping the seller an new - <insert your own word here>. Their business is going to go down the tubes. Guaranteed. Thais may not care about foreigners being ripped off, but rip off Thais -- Ouch!! Aunty Kaew admitted she was banged to rights on that one but argued that it was a first offence. More like it was the first time she was caught...!!! And they just pay because they are well aware that the local thug mafia will appear on masse in a few seconds if they don't pay / argue about the bill. Presumably they also checked her Income Tax returns? Location and vista command a higher price everywhere. Not sure of the current price of coffee and croissant at St Marks Square nowadays but last time we went you needed to get off the duck-boards and wade to you seat. Worth the money? Yes indeed. 2,000 THB for 8 people to lunch is just not expensive at all. Were the ripped off? Yes for 20THB. Did they enjoy the experience? Apparently not. Who in their right minds would allow their days holiday experience to be ruined for the loss of 20THB? Hmmm.